The Seminole Art Council has sponsored and promoted downtown Sanford's Fourth Friday Art Walk for several years now. The Welcome center opens it doors to local budding artists each month from September through April. 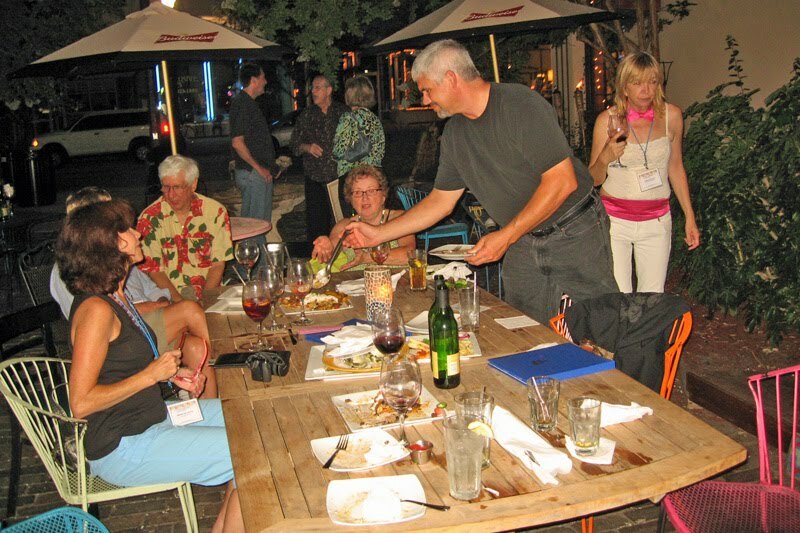 Additionally, the downtown art galleries are open with special events, demonstrations, and food and liquid refreshments. In past years, this event took a hiatus over the summer. This year, the Welcome Center is taking the hiatus, but the galleries in the area have chosen to keep up with the "Fourth Friday" tradition and continue the Art Walk in the summer months without the Welcome Center. So on the Fourth Friday of May, my friend Tommy and I headed to downtown Sanford for the Art Walk. Tommy is an artist and some of his works are currently on display at Art Affair Gallery, so that is where we spent a majority of our time. It was very busy there all night, with a nice flow of people in and out and a nice turn out of artists. We even had one artist painting near the front door, demonstrating the talent that goes into such an endeavor. We did get around a bit to check out a few of the other galleries as well. Gallery on First and Jeannine Taylor Folk art had a number of folks in, perusing the art. And Riverhouse Pottery had a potter demonstrating working with clay--that was quite interesting. All and all it was a fun time. And, for the first time, an "after hours" party was scheduled at Two Blondes and a Shrimp. Sherry gracefully arranged to have some appetizers and a number of artist, friends, and interested others gathered there. Some had dinner, some had drinks, and some had appetizers, but all had a good time. The after hours party was scheduled to start about 10 and it ran until past midnight. 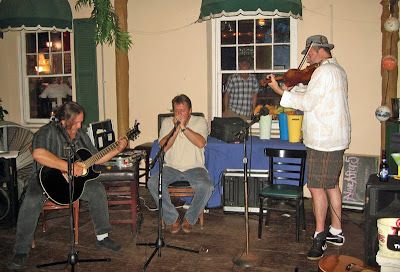 An added bonus was the live music in the outdoor setting. A very good time was had by all. 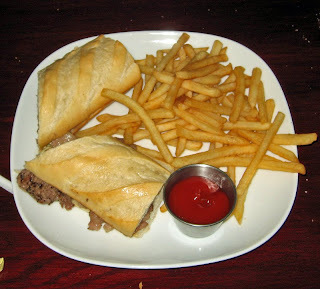 We had a nice dinner at newly opened Cafe Rouge in downtown Sanford on a recent Friday evening. It was about 8 PM. We were in Sanford for the "fourth Friday" Art Walk, a monthly occurence where the art galleries are open late and have special exhibits, demonstrations, and, of course, a few liquid libations as well as some munchies. Since my friend Tommy is an artist and has some of his works exhibited at Art Affair Gallery as well as the restaurant Three Blondes and a Shrimp, we like to attend. It's always a lot of fun. You get to meet various artist as well as lots of art lovers. So, we decided this would be the perfect evening to have dinner at Cafe Rouge. They've only been opened about five weeks now and are located in the former Quizno's location. The don't even have a sign up yet, but are open for breakfast, lunch, and dinner most every day of the week. They have a nice menu and I'd say the prices are reasonable. It's a family run business, so you can know that attention is paid to details. I noticed a baby in a swing and a young sibling, as well as the mother (I presume) taking care of the child in between waiting on customers and bussing tables. I like to see a place where the family is involved. 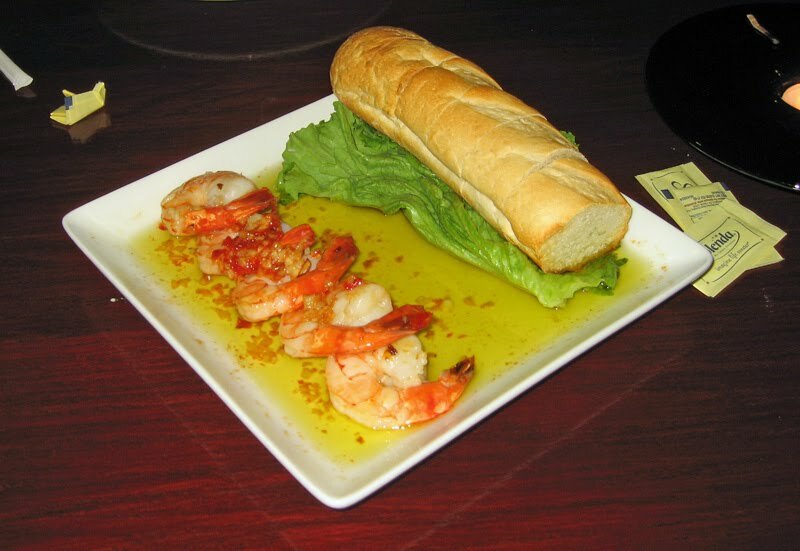 For an appetizer we ordered the Olive Oil Baked Garlic and Chili Shrimp. Five Shrimp had been cooked on a skewer and were placed in a lake of olive oil (very tasty olive oil!) and had some chili sauce placed over them. It was served with a baguette for dipping in the oil. Personally, I'd have liked a bit more of the chili flavoring, it was very good--there just could have been more. The shrimp were cooked fine, perhaps just a tad over-cooked but certainly not to the point of rubbery. The olive oil was grand. Overall, I liked this appetizer a lot and would have absolutely loved it if it had (1) a bit more of the chili sauce and (2) either more baguette or less olive oil. But a successful dish, no doubt! In due time our soup and salad arrive. My friend Tommy had the French Onion Soup. I had a sip and it was good. It has an interesting flavor. I was glad to see that it was not overly salted. I'm not exactly sure what the flavor was, perhaps a bit of red wine, but it was less beefy than I expected. Yet was good. Tommy liked it and ate it all. He did comment about the large bowl that it was served in, it made the portion seem smaller than it was. 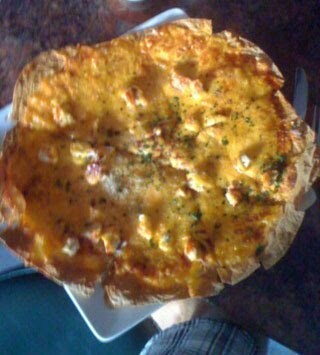 It was topped by a few slices of baguette that were covered with some cheese and toasted. Nothing overy fancy or special. But at any rate, it was good eats. My side salad was quite good. The first thing I noticed is that it was visually appealing--it just looked good. A bed of mixed greens had some diced sweet onion mixed in and a few grape/cherry tomato halves decorate the top. 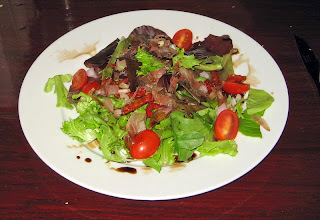 The house balsamic viniagrette was very nice, and it was not overly dressed, a pet peeve of mine. 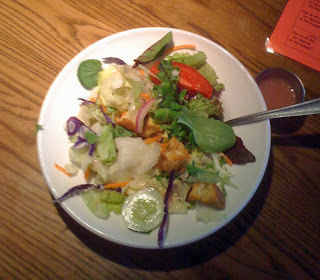 It was nice, light and refreshing, everything a salad should be--a nice prelude to the main course. It was a good salad, definitely. In due time our main courses arrived. Tommy ordered the Baguette Rouge chargrilled Rib-eye sandwich, sliced ribeye served on a baguette and dressed with a tarragon mayonnaise. It was very good. You could taste the tarragon in the dressing, which accented the meat itself. It was served with a side of french fries which were served fresh and piping hot as they should be. Good fried, nothing to out of the ordinary, but cooked well and served well. Tommy enjoyed it enough to eat the whole thing. And I had a bite and agree, it was good eats. 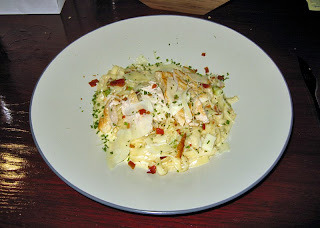 For my entree, though I was sorely tempted to order the traditional English-style beer-battered fish and chips, I eventually succumbed to the lure of the Creamy Chicken and Bacon Fettuccine--and I'm glad I was, it was very good. The best part and the most surprising part was that there were bits of sun-dried tomatoes in here. That gave it a unique and exceedingly pleasant flavor. All of the elements of this dish went well with each other. The fettucine was cooked right, and the dish itself was served piping hot--though I did notice that the chicken itself was a little bit less hot, though still plenty warm enough. It was a good dish and was finished with both some shredded and some shaved parmesan, a nice touch. We enjoyed our meal at Cafe Rouge and I'd certainly come here again. It's a welcome addition to downtown Sanford. With the recent closing of Angelos Pizzeria and Italian restaurant, Colonial Room's scaling back of dinnertime hours, and Stone's Throw Bistro's closing during lunchtime, hopefully Cafe Rouge can fill the gap for Sanford diners. Downtown Sanford has lots of great places to eat, and Cafe Rouge is one of them. Good Eats, for sure! The food is always decent at Uno Chicago Grill, I've never had a bad experience here, and my visit on a recent Friday afternoon with some friends was no different. We arrived shortly after noon. In years past, we'd have had to wait a bit, but in today's economy, there was no wait at all. 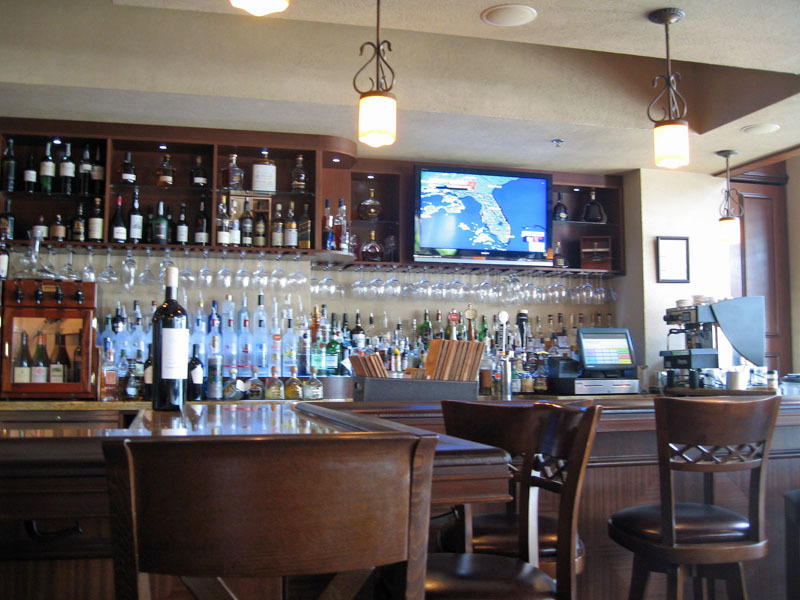 No matter, we were promptly seated in a booth by the bar and our server quickly appeared and took our drink orders. 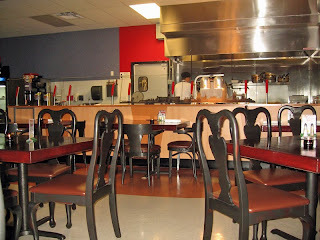 We each had coupons, and our server was well aware of what that entailed and was able to answer all our questions. In due time our drinks arrived and we placed our order. She did not write anything down and we all got just what we ordered, a testament to having good help! I started out with a side salad with the house raspberry viniagrette dressing. 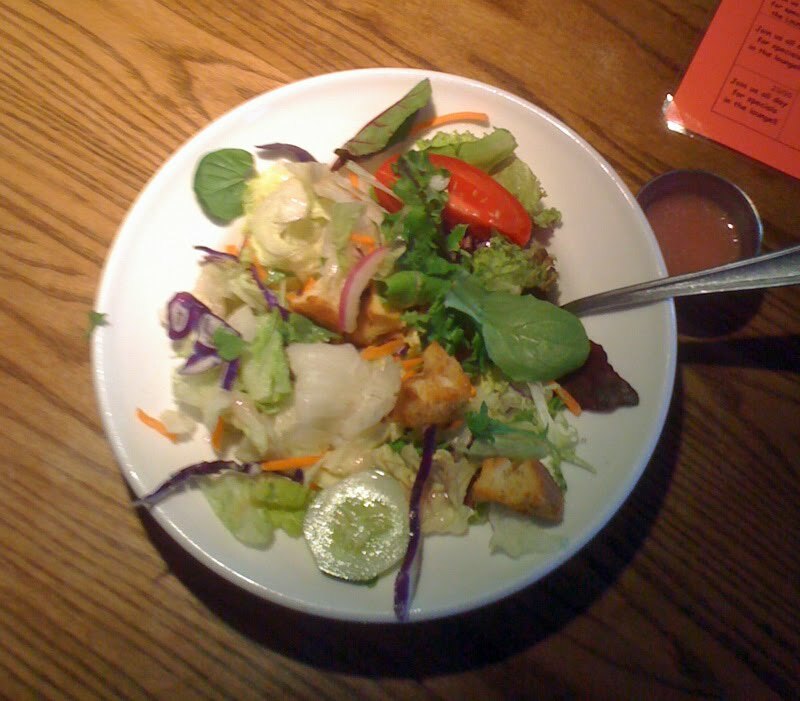 The salad was very good, an assortment of mixed greens topped with the requisite slice of cucumber, wedge of tomato, a round of red onion, and a few croutons. A good salad, definitely. Both Bob and I had ordered salads, and a bit after we finished them our entrees arrive. The only problem with that is that Dale's entree did not arrive at the same time. It was not our server who brought the entrees, and she said she'd check. Our waitress came by almost immediately and, when we told her about this faux pas, she went off to check on things. Within a minute or so, Dale's entree arrived as well, along with apologies from the waitress. Turns out our two entrees came up first (we both had fish) and Dale's apparently took a bit longer--she's ordered a steak and shrimp combo. But, finally, we were all eating. For my entree, i choose the Baked Haddock, a fairly good sized piece of haddock had been topped with a cracker crumb mixture and baked. It was served with a side of steamed broccoli. I have ordered this before at Uno's and it is consistently good. The cracker topping may not be the healthiest, but the baked haddock definitely is. Along with the steamed broccoli, it was a very good meal. 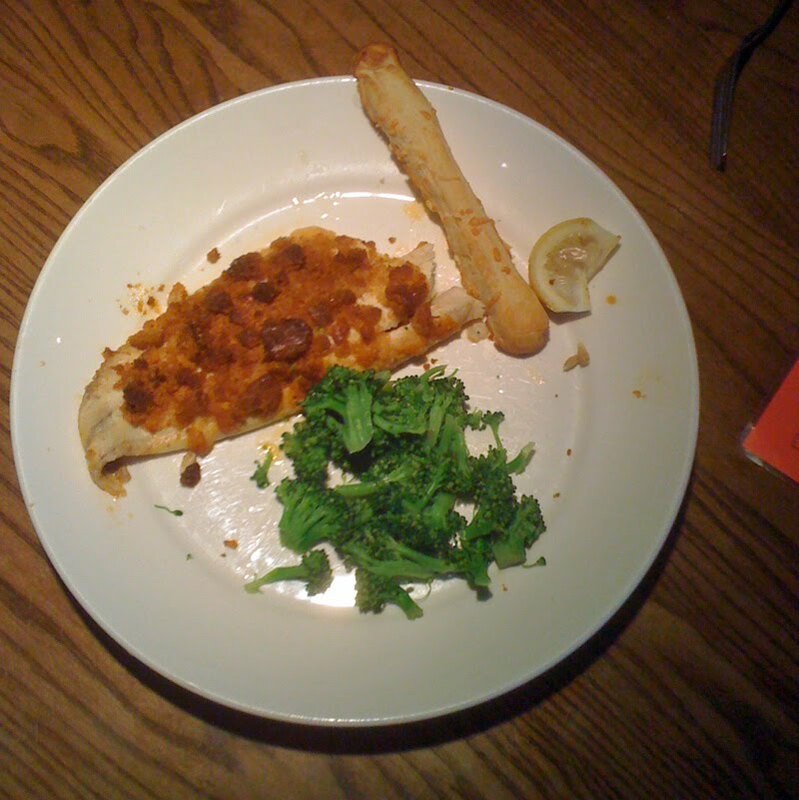 I Also enjoyed the breadstick--it seemed like part biscuit, part breadstick, with a nice parmesan and garlic flavor. A nice touch. I'd say my broccoli could have been steamed just a little less, but that's my personal preference, it was not overcooked and was quite good. Doused with a bit of lemon juice, i loved it and ate every bit. 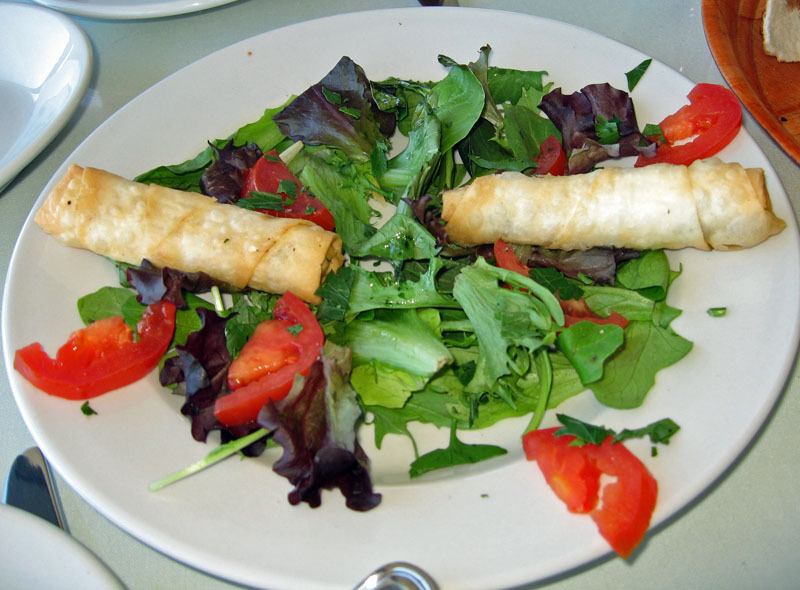 The appetizer should not arrive at the same time as your meal! However, that is the only substantial complaint I have about my recent meal at Lime Restaurant in Daytona Beach. My friend Tommy and I ventured to the boardwalk area of Daytona Beach on a recent Saturday evening in May, before the start of the tourist season. It was a very warm and pleasant evening and surprisingly busy with lots of people out and about. I'd wanted to try Lime Restaurant for some time. This was the time. It was not crowded and we had no wait for a seat. Lime Restaurant is a big place with a large open area in the center of the room, a bar and bar seating in one quadrant, and tables for dining around the sides of the room. I'm guessing maybe it's a busy night life sort of place later in the evening. We were promptly greeted and seated. In due time our waiter came and took drink orders and answered a few of our questions. When he returned with the drinks, we told him we'd like to start with the Chicken Skewers. He left to put in the order while we continued to peruse the menu. After a bit he came back and took the rest of our order. In a short time, my salad arrived. I'd ordered the Creole Salad. It was very good. 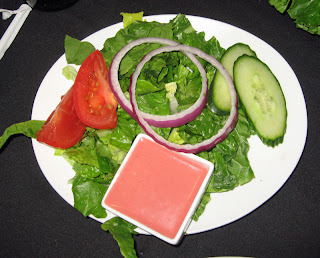 Hearts of palm and tomatoes were served over romaine lettuce, the salad dressed with a cilantro and lime viniagrette. It was absolutely delicious and it did not take me long to devour it, though I did think the salad a bit on the small side given the $5 price tag. No matter, it was certainly very good. It seemed that our wait was a bit long, and then all of a sudden a few staff came with out dinners and our appetizer, all at the same time! I was certainly surprised. I believe we ordered the appetizer in plenty of time for it to have been truly an appetizer, so I was disappointed with what I'd consider a kitchen timing issue. That was a bit of a let down. For the appetizer we ordered the Chicken Skewers. Two skewers each had several pieces of chicken which had been marinated in a Jamaican jerk marinade.This was served with two sauces, both very good. One was an avocado based sauce, the other I'm not certain of. I guess if the appetizer had been served first rather than with my meal, I'd have been able to pay closer attention to it. The skewers were on a bed of rice which served to soak up any juices. The chicken pieces themselves were very tender, juicy, and flavorful. 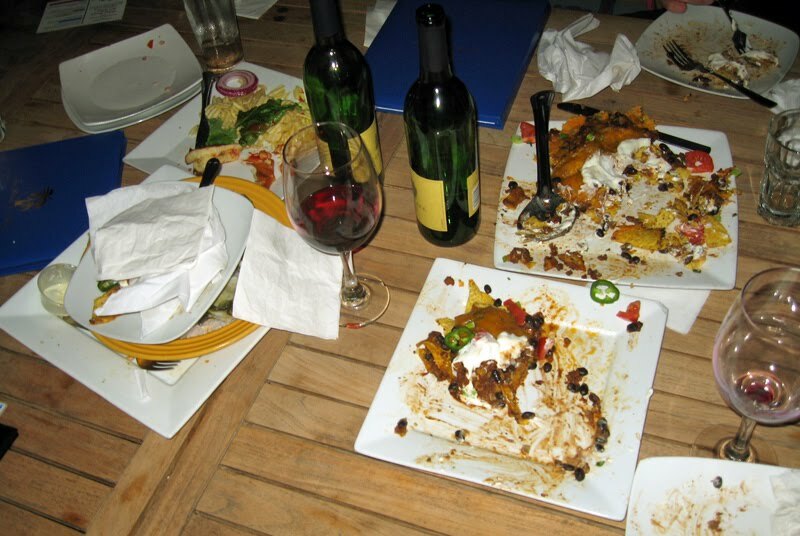 I did think that the two sauces were just kind of thrown on the plate, they did not look very organized and seemed just a bit mess. But they sure did taste good and all the ingredients went well together. For his entree, Tommy ordered the Island Roasted Pork and it was delicious. Pork had been slow roasted and pulled apart. It was served with Congri, Cuban black beans and rice. Tommy commented that the Congri seemed a bit pasty and I must agree, as if it had been holding for some time, it was just a bit starchy and the rice a bit flat. However, the delicious pork made up for this shortcoming. 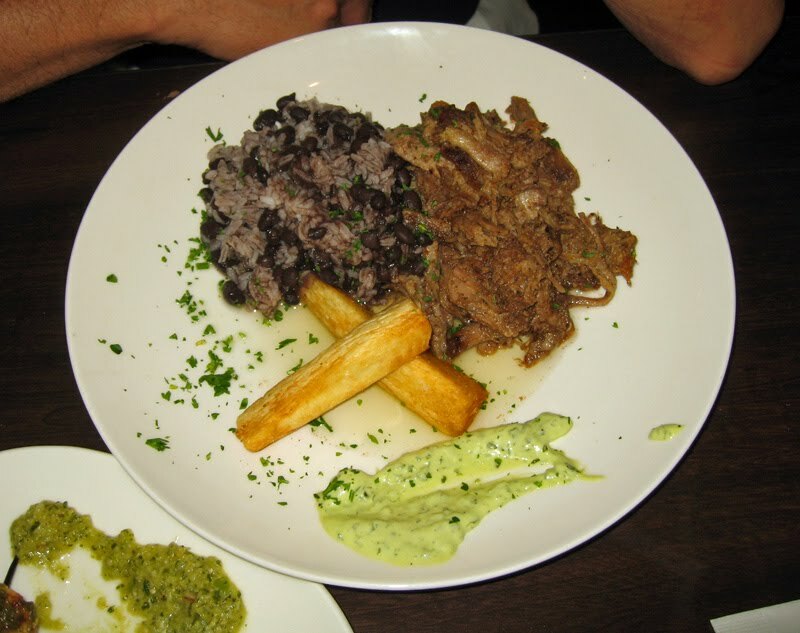 The dish was served with two yucca fries (yes, only two) and an avocado type sauce. Overall, it was a very good dish, quite yummy. For my entree I had the Skirt Steak with Chimichurri. All I can say is, "yumm." The skirt steak was cooked just a tad beyond the requested medium rare, but was still quite good. The chimichurri sauce on top added a nice depth of flavor to an already flavorful cut of meat. Two pieces of broccolini graced my plate--they were delicious. And I had a few more yucca fries than Tommy, along with the avocado sauce. 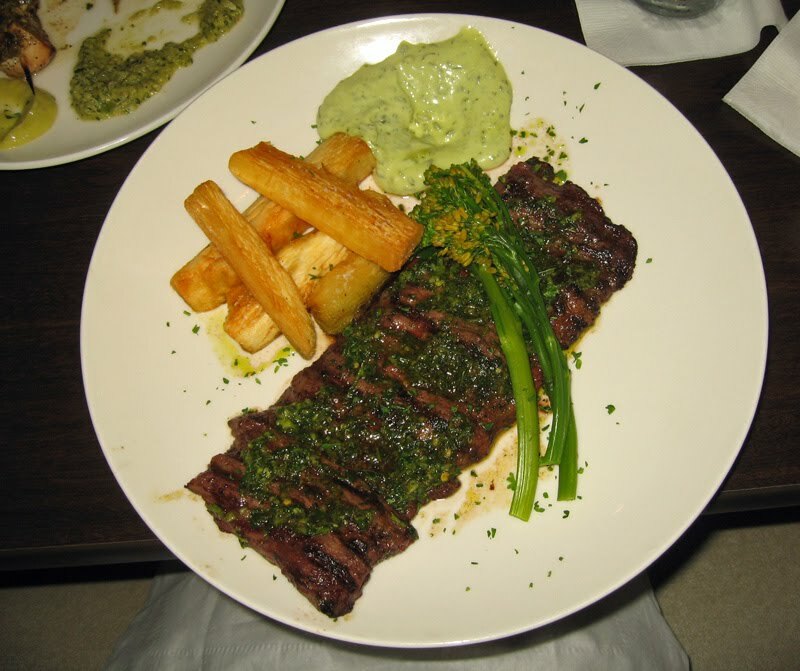 But the real star of my meal was the skirt steak--it was delicious. I enjoyed our meal at Lime Restaurant. In general, the food was very good, spot-on. The timing was a bit off, but the food was excellent and made up for that. I'd eat here again, definitely! We had a surprisingly good and pleasant early Sunday afternoon brunch here the other day. My friend Tommy and I went out for lunch to the Colonial Town Park area in Lake Mary and decided to try The Vineyard Wine Company--I had a menu we'd picked up there previously and it all looked so good. I'll certainly go back for dinner some day. The atmosphere at The Vinyard Wine Company is very nice, lots of dark wood around the bar with lighter stone and beige colors elsewhere, and wrought iron on the front and the door, giving it a grand, spectacular, and rich look. We arrived during "brunch" time on a Sunday when they have a special brunch menu with a limited lunch menu (also served on Saturdays). It was not very busy when we were there, around 1:30 PM, though a large party of about a dozen well dressed patrons was just beginning their meal when we arrived, and several other tables were occupied. Our waitress promptly arrived and provided some guidance and answers to our question. We had never eaten here before so took some time to study the menu. Eventually for drinks, we settled on a Hibiscus Mimosa (for me) and a Bellini for Tommy. Wow, both were very good. Mine had an edible hibiscus flower in the bottom of it. I ate it and it was wonderful, very sweet, and obviously had been sugared in a simple syrup. Wonderful taste though. In reading the regular menu at home, I'd noticed a shrimp appetizer that sounded wonderful. We asked our waitress if it was avaible and she said she would check but thought they'd be able to do it if they had the ingredients. We were in luck, they could make it. So we started with that, the Rocket Shrimp. Oh my, was that good. 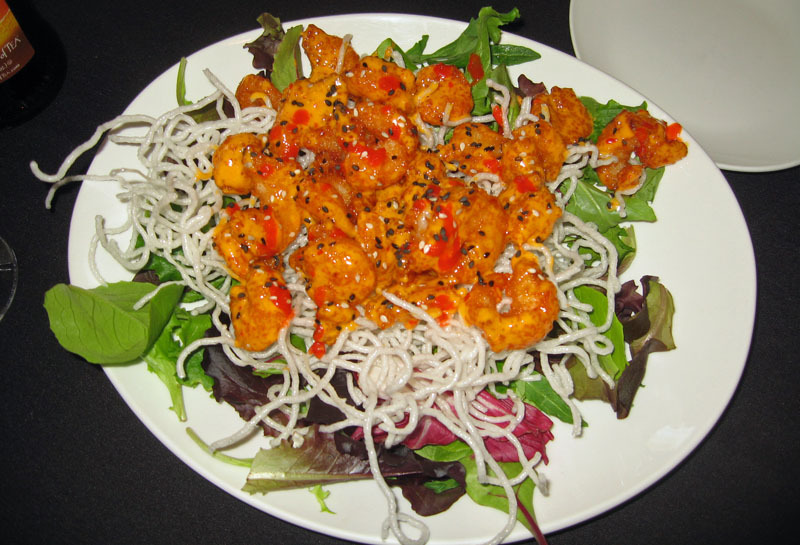 The medium sized shrimp were lightly breaded and fried and tossed in a creamy sweet chili sauce and drizzled with sriracha and sesame seeds. They were served on a bed of crispy rice noodle that were themselves on a bed of field greens. The shrimp were well cooked, though could have used maybe 30 less seconds of cooking. Still, they were nicely cooked and not rubbery, but just short of perfection. 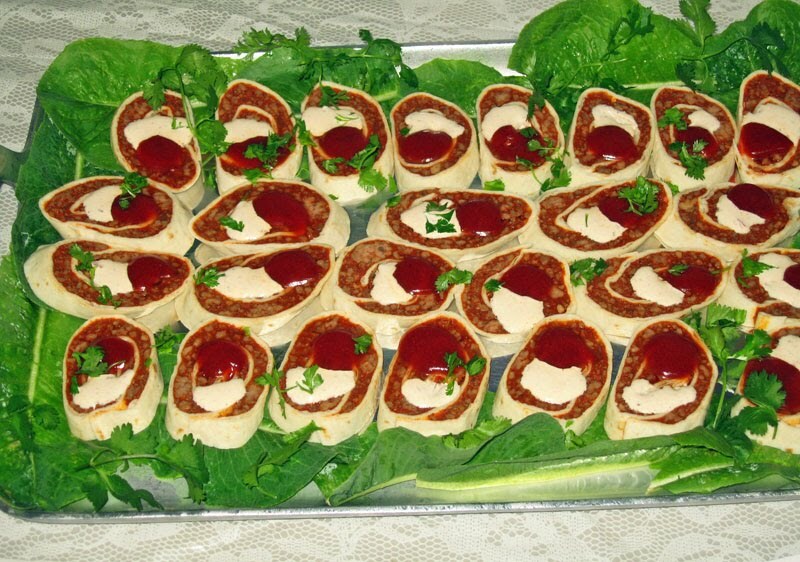 But the taste of this appetizer was spot-on, I'd call it excellent, bordering on outstanding. Wow. We ate every bit of this appetizer and even cleaned up the rice noodles for the chili sauce they sopped up. An excellent dish and a great start to our meal. I started my meal with a salad. It was a very nice salad. The best part of it was the homemade champagne viniagrette dressing--it was wonderful with a perfect balance of sweet and sour and the creamy smoothness of the oil. Wow. The lettuce was fresh and dry, and it was served with tomato, cucumber, and red onion slices. Above all, I enjoyed the freshness of the salad. It was a nice counterpoint to the spiciness of the Rocket Shrimp, though that did cause me to pursue a second mimosa, this time Pomegranate--also very good. For my main course, I ordered the Tuscan Quesadillas. 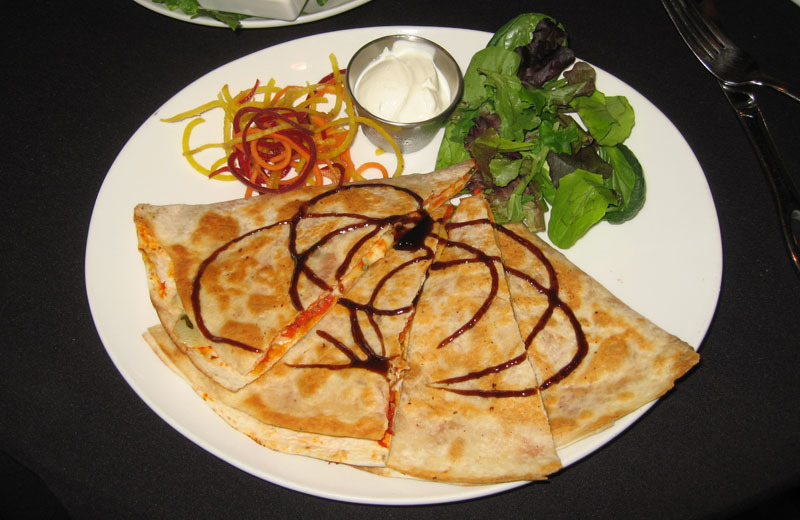 A flour tortilla was stuffed with a mixture of tender chicken, cheddar cheese, sundried tomato pesto, and marinated artichoke hearts. It was cut and drizzled with a balsamic vinegar reduction, and served with some sour cream, a bit of fresh greens, and a garnish of curly-julienned carrots and red and yellow beets. Everything was very tasty indeed, including the carrot/beet garnish. The quesadillas were excellent and the marinated artichoke hearts (along with the sublety of the sundried tomato pesto) gave it a very rich and interesting flavor. This was a very good dish and I loved it. And it looked very good too. 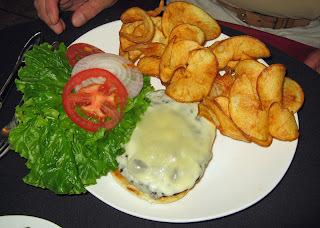 For his main course, Tommy ordered the Black Angus Burger, a half pound hand-crafted burger seasoned with the chef's blend of seasonings and spices, served on a nice roll with lettuce and tomato and onion on the side. It was topped with a thick slice of provolone cheese and accompanied by "slinky chips." Slinky Chips are thick cut chips cut with a device that cuts around and around, thus giving large fries which form interesting shapes when fried. They are then tossed with a white truffle oil. They have an amazingly good flavor and are crispy and hearty. The burger itself was excellent, nice and tender and juicy. Tommy pronounced one of the best he'd ever had, second only to the Burger a Morgan's Burger Bistro in Sanford. So it was an excellent choice. We had an excellent meal here. 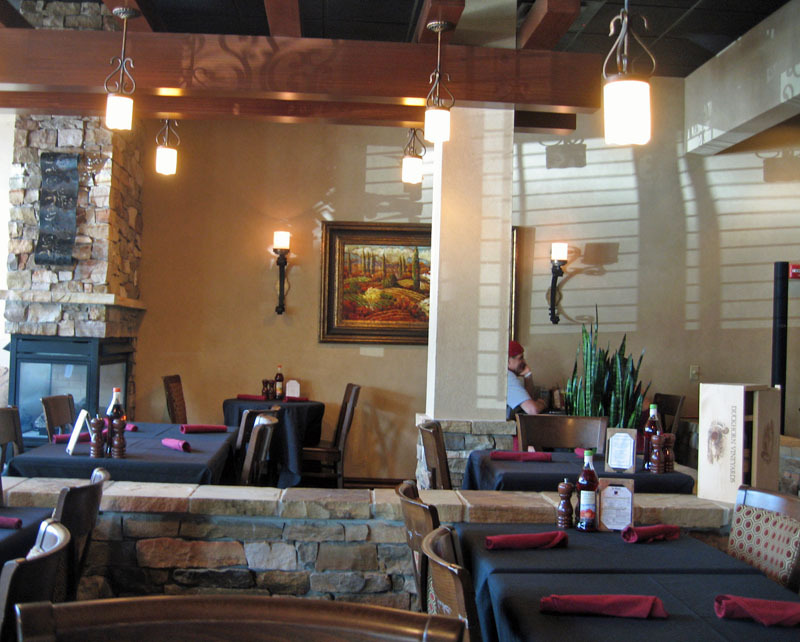 The service was excellent as was the food and the atmosphere. They were accomodating to our special request (the Rocket Shrimp) and everything served was fresh and very, very good. I would love to come back some night for dinner, the menu looks really good. The inside is warm and inviting. They also have a wine and gift shop next door and quite a wine cellar as well. I guess one should expect that with a place named "The Vineyard Wine Company." I enjoyed my experience here and definitely will be back again another time. 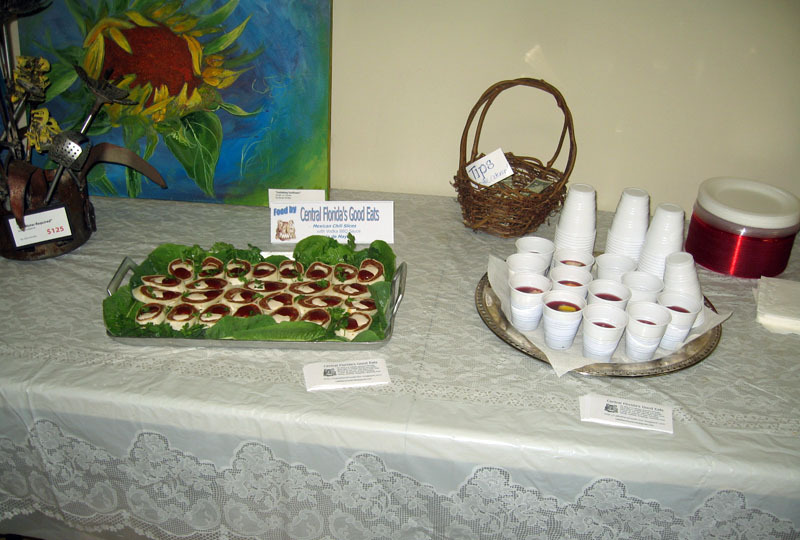 At last week's Alive After Five street party in downtown Sanford, I made the appetizers for Julie Kessler's "Earth to Metal" art opening show at Art Affair Gallery. My fair was simple yet, so I was told, delicious: Mexican Chili Slices served with a Mexican Sangria. Here's how I made it. In a skill, begin to brown the ground chuck, addin the onion just as it starts to brown. Cook over medium to medium high heat until all liquid has evaporated and it just begins to sizzle. Remove from heat and strain off the grease. When strained, return to the hot pan, continue to cook and add the minced garlic, cooking about aminute until the garlic is fragrant. Add the tomato sauce, and tomato paste and mix well, then add the rest of the spices. Bring just to a simmer, then simmer on very low about two hours. If mixture becomes too dry, add a bit of beef stock, but do not let it get too thin. Once it has simmered a good long time, remove from heat, allow to cook, then cover and refrigerate for several days. Combine all ingredients in a saucepan and simmer for 15-30 minutes. Cool and refrigerate. Will keep several weeks. Mix all ingredients in a food processor. If it's too spicy, you can add a bit more sour cream. You will also need about 3-4 12" flour tortillas. To assemble, warm the chili to just above room temperature to make it easy to handle. Spread about 3/4 cup chili on a tortilla, staying 1/2 inch from the edges. 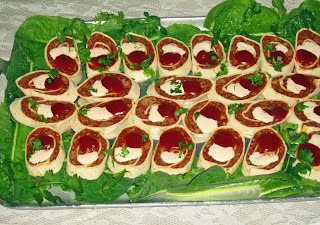 Roll up like a pinwheel, then roll in aluminum foil, pinching and twisting the ends, to make a round loaf like a sausage. Repeat, using all the chili. Refrigerate overnight to set. The next day, unwrap the rolled chili and bias slice about 3/8 of an inch thick. You should get about 13-15 good slices per roll. Arrange on a platter and top each with a dollop of the Mexican Crema and a squirt of the Vodka Barbecue sauce. Garnish with a small piece of cilantro. Serve and enjoy! 1 2-liter bottle lemon lime soda. assorted apples/oranges/lemons, sliced thin for serving. Put all ingredients thru the 12 cloves into a large pitcher, stir, and refrigerate overnight. 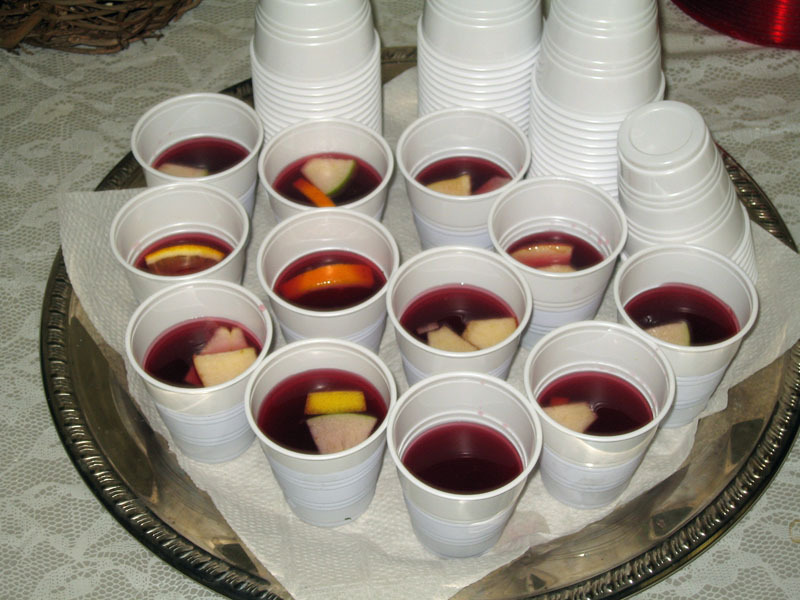 When ready to serve, transfer 1/3 of liquid to a separate pitcher, add 1/3 of the lemon-lime soda, and serve in small glasses that are already prepared with some additional slices of mixed apples/lemons/oranges. Serve and enjoy! Repeat until you've served it all. My friend Tommy and I stopped by White Wolf Cafe the other night and were pleasantly surprised by the good food we had there and by the place itself. Upon entering, we seem to have entered an antique store with lots of old stuff everywhere. Even the tables were old....pieces of granite that seemed to have been broken off from some larger piece. We were first steated at a small table for two, but upon our request, moved to a larger table for two. Whew! We had a chance to peruse the menu... pretty nice selection, for sure. It was about 7:30 on a Friday night but not very busy. I wonder when the busy time is. 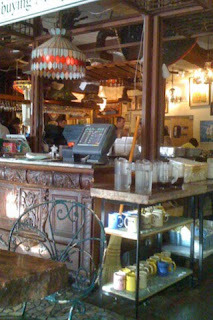 Still, There were a number of tables occupied and a full staff that seemed very attentive--no complaints here. Eventually we decided to order, though it was not an easy decision. the menu is full of things that look very good. For my dinner I started off with a salad. It was a normal salad, good, fresh, and tasty, a lot like many other salads I've had. No complaints, but it was just normal or ordinary. 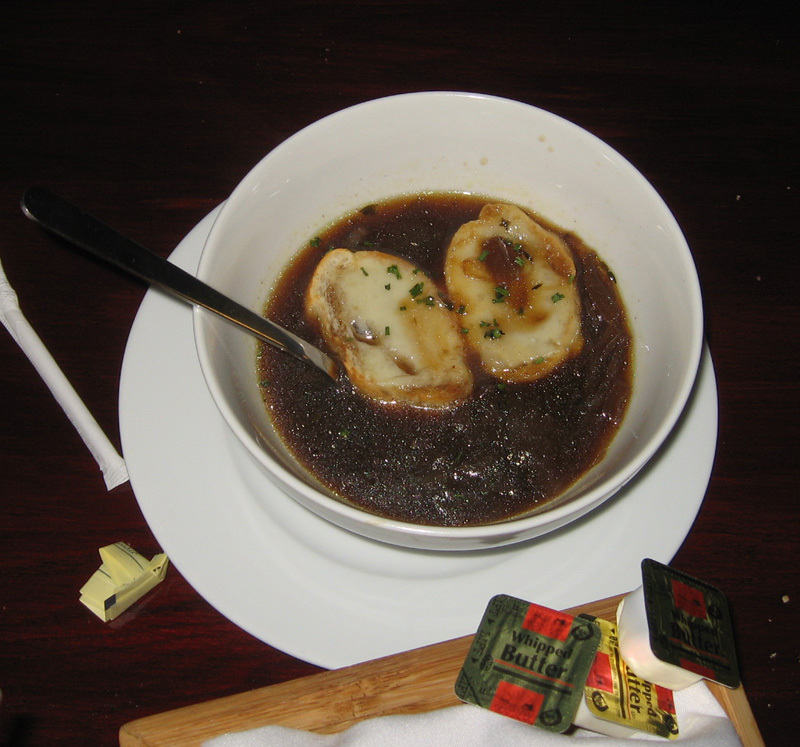 My friend Tommy started out with the Navy Bean soup--it was excellent. A nice bean flavor seasoned with ham and having a nice mouth--feel that you can only get when a nice ham bone is used in the preparation. This was a very good soup! But then came the entrees. My friend Tommy Ordered the Chicke Fried Steak... it no only looked amazing, but was tasty and delicious as well. A nice piece of steak had been tenderized, then breaded and deep fried. This was definitely no pan fried steak, definitely deep fried, and it showed. It was excellent, tender, moist, and juicy. It was served with mixed veggies and with garlic smashed potatoes that were excellent. Great flavor and texture. And for my entree, I ordered the BBQ Chicken flatbread. I love BBQ Chicken pizza, but this was a true flatbread, think as a dime, crisp and flaky. The toppings were awesome--a bit of barbecue sauce, some red onions, a few chiken cubes (OK, the chicken did seem a bit sparse), and topped with Cheddar cheese. This was very good and all i expected it to be. The flatbread was innocuous and subtle...the main flavors were onion, chicken, BBQ sauce, and the cheese. A very successful dish. The presentation was also nice, the flatbread far overexceeded the size of the plate it was served on, thus making it seem even larger. 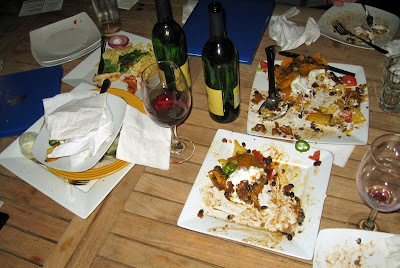 No problem, I still could not finish it all, and had several pieces to take home, which i did finish off a few day later. Lucky me. We had a wonderful meal here and I'd go back in a heartbeat. 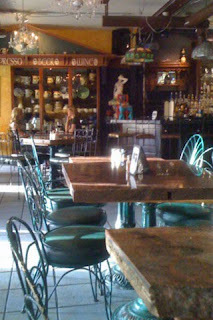 A very cool place in the Winter Park/College Park area. I recommend you give it a try sometime. I'll be back for sure! On the second Thursday of each month, First Street in Downtown Sanford is blocked off for the Alive After Five party. 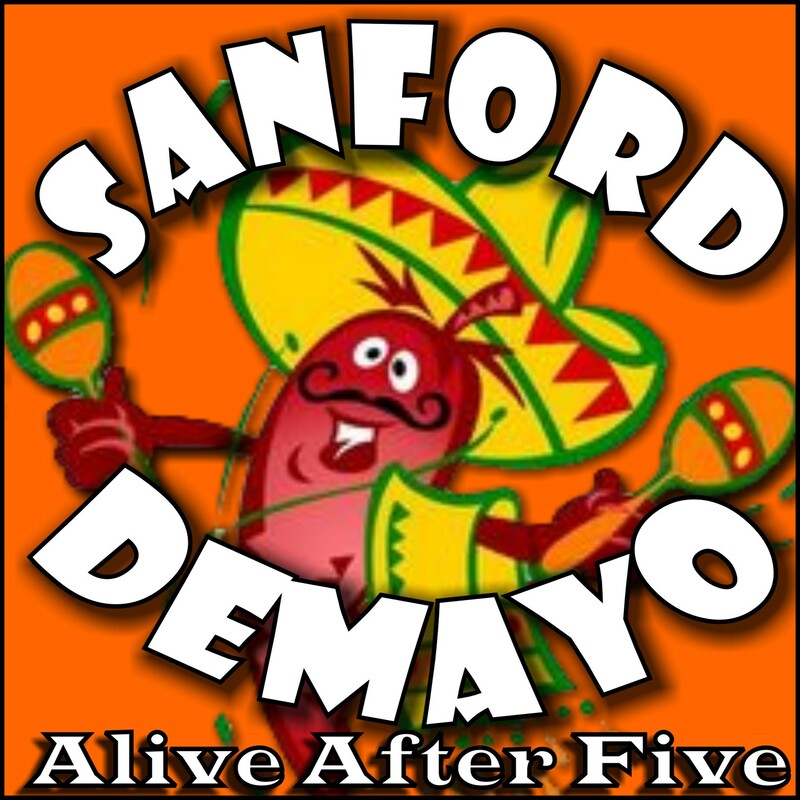 May's theme was Sanford de Mayo. The music was Mexican and much of the food decidedly Mexican as well. I have been attending this event almost every month for a good three quarters of a year and I love it, each and every time. Basically there is a stage and live music set up on one corner, and both sides of the street are lined with vendors handing out food and drink samples and of course promoting their business. Some of the fare is pretty standard--a window business handing out little samples of chips and store-bought salsa. But some of it is pretty amazing--the restaurant Two Blondes and a shrimp was handing out there absolutely delicious Tortilla Soup. It was awesome! Of course one of my favorite places to hang out is Art Affair Gallery, mostly because my friend Tommy has a lot of his artwork there. I've gotten so that I know a number of the artists. And, I've been making food for some of their events. Usually on the second Thursday they have an Artist's show opening and that was the case this month, a show by metal sculptor Julie Kessler. She does some really fine metal work and work in other media. It's great that she has the show room all to herself this month. You can read more about Art Affair's words in another blog as well, Abbe's World of Wildlife. Check it out! I also do my part for Alive After Five many months. This month for Julie's opening I provided the food. That is to say, I did the cooking, too. For Sanford de Mayo I made Mexican Chili Slices and Sangria de Mayo. I will be writing about that here in my blog in the next few days. I'll even give you the recipe! Admission to the event is $7 and for that you get a wrist band that entitles you to all the samples you can eat and drink. You also get two beer tickets, and a "coin" good for the sponsored food vendor. This month it was co sponsored by Don Pablo's in Sanford, they had tacos. I went by late and they were all out, they'd served 2500 people! Later they brought in some shrimp and I had them, they were delicious. Next month the theme is Blues and Bar-Be-Q. Also coinciding with it will be the opening of an art show by my friend and artist, Tom Abbott. So I will again come up with some yummy themed concoction for his opening. Any ideas? Alive After Five is always a very fun time. Check it out, it is THE place to be in Central Florida on the second Thursday of each month 5-8 PM, on First Street in downtown Sanford. Arrive early to get a good parking spot. And stop by Art Affair Gallery, try some of my food, and tell me what you think! On a Saturday morning, I enjoy stopping in at the Lake Mary Farmers Market. I have taken home a lot of good food and other great things from this place. Open from 9:30 AM to 1 PM and located on the grounds of the Lake Mary City Hall, this market boasts not only fresh produce, live plants, good food, and artisanal foods and crafts, it also often has other activities associated with it such as fitness classes, an Easter Egg hunt, and other children and family centered activities. There are several great restaurants nearby, or sample the Barnwood pulled pork sandwich--one of my favorites. There seems to be something for everyone here. Last year i filled my herb garden with plants from here, and I also have quite a few orchids that I purchased here for well under the big box store fancy prices. I love this place! The place to go on a Saturday morning to find fresh produce, honey, breads, orchids, flowers, crafts, and a whole lot of other things is the Sanford Farmer's Market. Open every Saturday from 9 AM to 2 PM, it's located in Magnolia square right off of first street in downtown Sanford. I've never eaten in a Turkish restaurant before, but my first experience at Efes Turkish Restaurant was very positive and I think I'd like to go back for more! I am a big fan of downtown Sanford which maintains a small community feeling with it's quaint shops and restaurants on First Street nearby. I was excited when I heard that a new restaurant was opening in the place formerly occupied by Limoncello's. So, on a recent Sunday afternoon, my friend Tommy and I decided to try it out. It was a good choice. 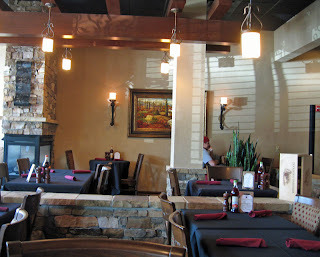 The interior decor is very nice, but it was a beautiful afternoon and we chose to sit outside on the patio. It's a screened in patio and overlooks Lake Monroe. On personality and view, this place scores and A+. We were promptly greeted upon arrival and seated and within a minute our watier arrived with water, produced menus, and asked if we'd been there before or were familiar. We were not and he was quite helpful in helping us decide on what we wanted to try. He suggested we start out with the bread, called Lavash. 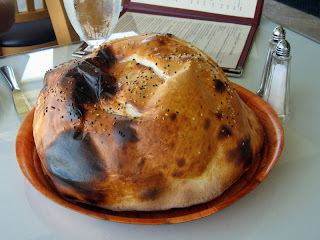 I imagine our eyes popped out of our heads when it arrived, it was a large loaf, round and about 10 or so inches in diameter. We were told it was perfectly fine to eat with our fingers and so we did...upon breaking it open we found it was mostly air. But, it was delicious and needed no butter or anything else to go with it. The slight sprinkling of sesame seeds on top were all it needed to give it a great flavor. And it was fun to eat, too. 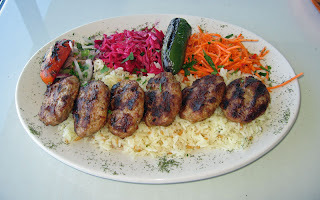 I will preface the rest of this with this disclaimer: I've never had Turkish food before and am thus no expert. I cannot tell if the things we ate were authentically cooked and flavored or not. But I can tell you if it was prepared well and tasty. So, read on! We started with some appetizers. The first was Soslu Patlican. This was beautifully presented and, fortunately for the two of us, served in two small bowls. It was eggplant roasted in a tomato sauce. 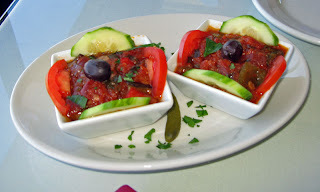 It was garnished with a few slices of cucumber and fresh tomato, and topped with an olive. The taste was delicious, a bit tangy, yet without any one overpowering taste. A bit of goodness in each bite. I definitely liked this, and so did Tommy. Next up was a second appetizer, Sigara Boregi. Note that in the picture, half of the serving is missing--it looked so good we dug in before I could snap a picture! Basically this is a cigar shaped pastry--phyllo dough is rolled around a feta cheese filling and it's then deep fried. It was served on a mix of greens and tomatoes. The texture was delicate, the taste cheesy and creamy. As a bonus, the greens were tasty as well and I ate every one of them. Yumm. Now it was on to our main dishes. Tommy ordered the Chicken Adana. 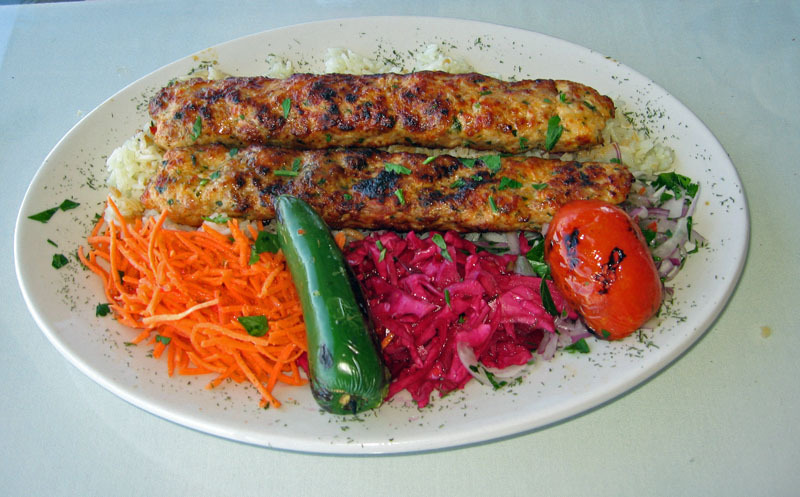 This a mixture of ground chicken that is shaped into a long and rectangular rectangle, usually on a skewer it appears, and then grilled. No skewer was evident, but this was a highly tasty dish with nice flavorings and spices. Tommy is not an overly adventurous eater, but he really liked it. I tasted some and it was indeed very good. It was served on top of some very flavorful rice--we both commented how the rice was far from ordinary. 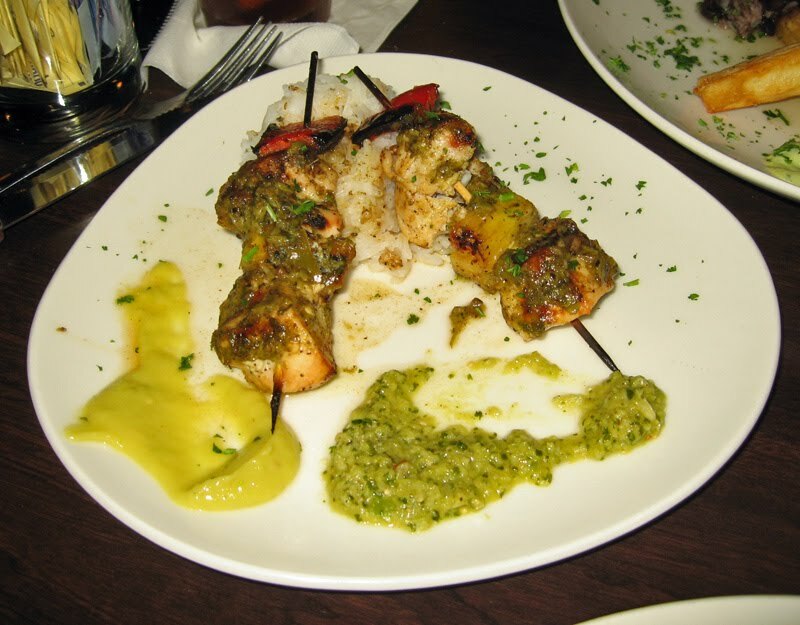 Both of our dishes were garnished with a grilled jalapeno. I enquired about this and our waiter told us that in Turkey they use a slightly different though similar pepper. That is not available here, so they use a jalapeno. I ordered the Lamb Kofte. It was absolutely delicious. Flattened meatballs of lamb, bread crumbs, onions, and other spices had been grilled to perfection. The patties were still juicy and flavorful. Tommy did not like the thought of eating lamb, but after tasting some of mine, his opinion is forever changed. Yes, they were that good. My lamb patties were served on a bed of the same delicious rice. Accompanying both our meals were some interesting sides. The first was a carrot julienne salad. It was very simple and boasted a nice carrot flavor. There was a tiny bit of seasoning in it, but I could not tell you what. The cold crispiness was a nice contrast to the meat and rice of our dishes. The second was a red cabbage slaw--sliced red cabbage was somewhat pickled my a vinegar flavored brine. It was very good. There was also a tiny bit of a red onion relish, again somewhat pickled. Again very good. Last but not least was a grilled tomato--it added nice contrast on the plate and also tasted good. We were not able to finish our meals so our waiter gladly packed them up to-go. But then once we had our check, he asked if we'd ever tried Turkish coffee. We had not so he offered us some one the house. We gladly accepted. Then he said that it would be great with some rice pudding and he'd bring some of that too for us to share, again on the house! Well, how could we say no--and we did not. In due time it arrived. The Turkish coffee was good, it seemed rather strong and was served in what amounted to a shot glass. The rice pudding was excellent, it had been baked, then cooled, and was garnished with some ground pistachios. Again, it was very good. 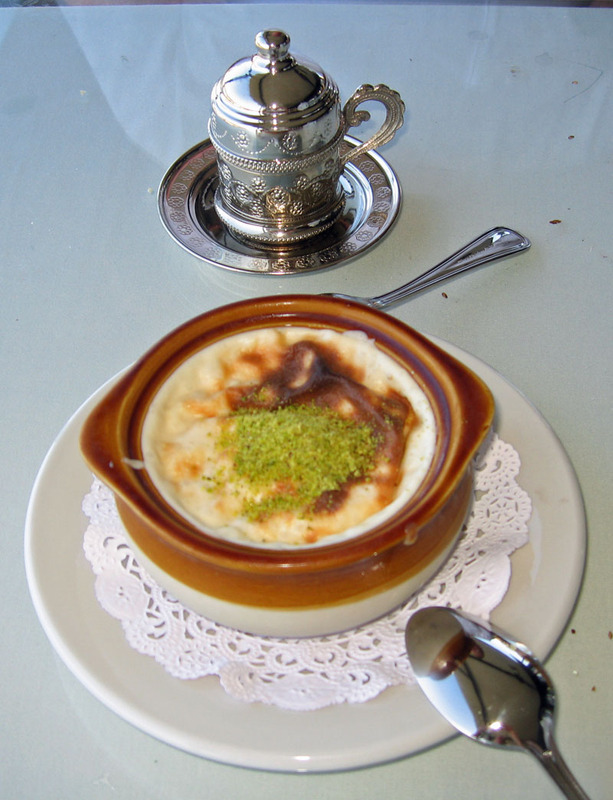 It was not overly sweet, but the sweetness and creaminess was well balanced with the Turkish coffee. What a nice way to finish a meal. We were impressed by the food and service at Efes Turkish Restaurant. 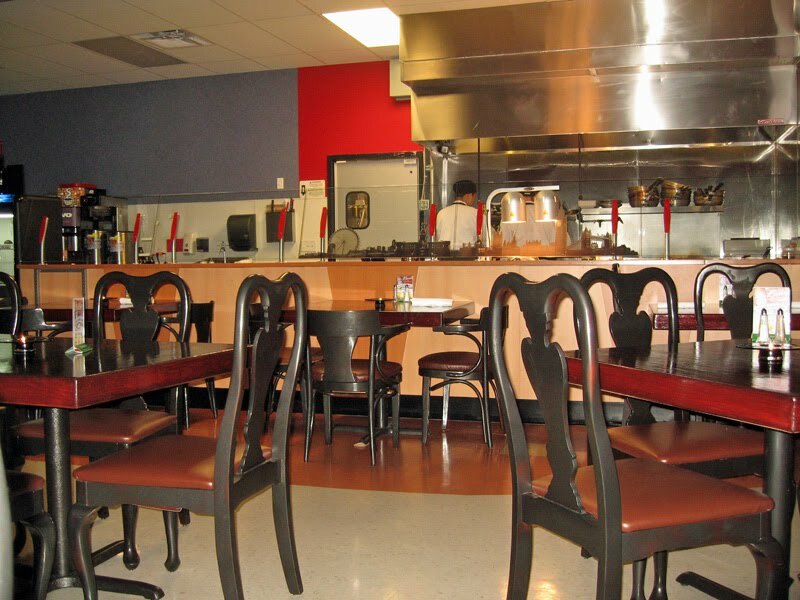 According to a story in the Sanford Herald recently, the owners used to own another successful Turkish restaurant in Orlando. Well, they've done a good job here. I sure hope they continue to do well. I'd surely eat here again. Our total bill including tax (but not our generous tip) was just over $48 and included the two appetizers, bread, and the two entrees. I thought I got my money's worth and brought home a decent sized doggie bag to enjoy another day. Well done!